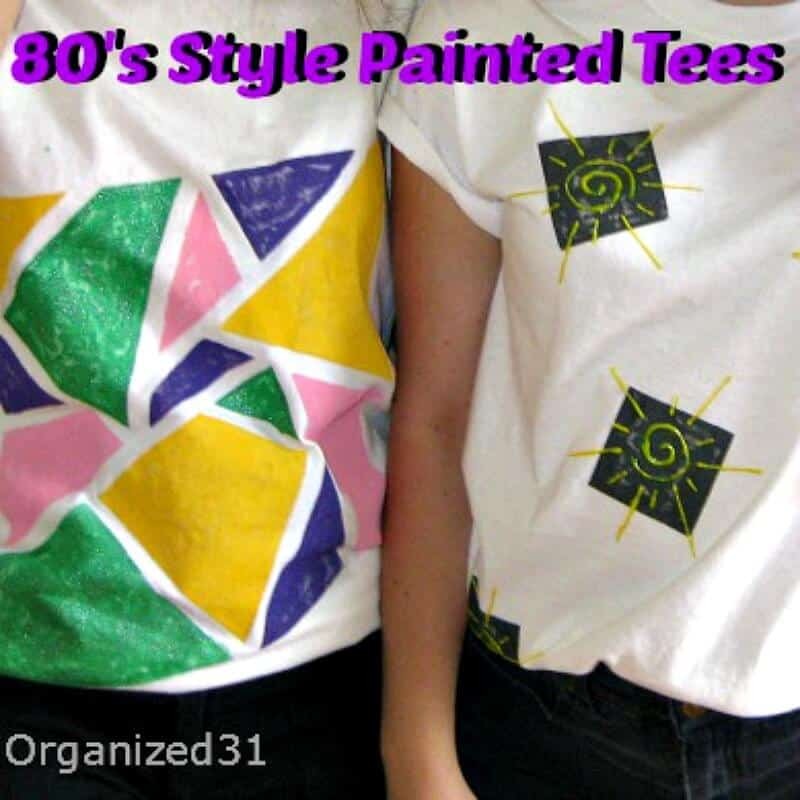 Relive the 80’s and have fun making your own 80’s style painted tees. There may be those that hate the 80’s and 80’s styles, but one thing no one can dispute is that the 80’s were fun (I know I was there!). Tulip Paints were there, too. 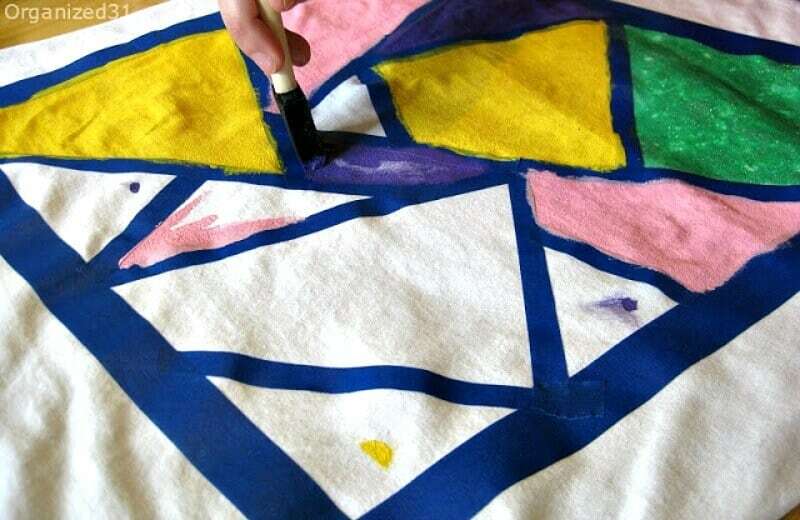 One of the fun memories I have of the 80’s is painted t-shirts. The designs were kinda crazy (some might say hideous), but they were definitely fun. Recently Tulip Paints gave me the opportunity to relive my youth and share the fun of decorating t-shirts with my children. We received a bunch of great Tulip products to try out. But my favorite (and my daughters’, too) is this authentic 80’s idea sheet that Tulip included. My daughters and I shared a lot of laughter and memories paging through the pictures. (Remember the inspirational poses, you’ll see them again soon)We decided that we would use Tulip Soft Paint and Tulip 3D paints to make their tees. My girls were inspired by the 80’s designs but wanted to put a more modern twist on them. I was amused and hoped for the 80’s-ier the better. My oldest, Baby, chose to go with a block pattern. We used painters tape to make the blocks. Baby determined the size square she wanted, measured her pieces of tape and then placed the squares where she wanted them. It’s important to take the time to thoroughly smooth the inside edge of the tape down (where the paint will be) so that the paint doesn’t bleed under the edge of the tape. 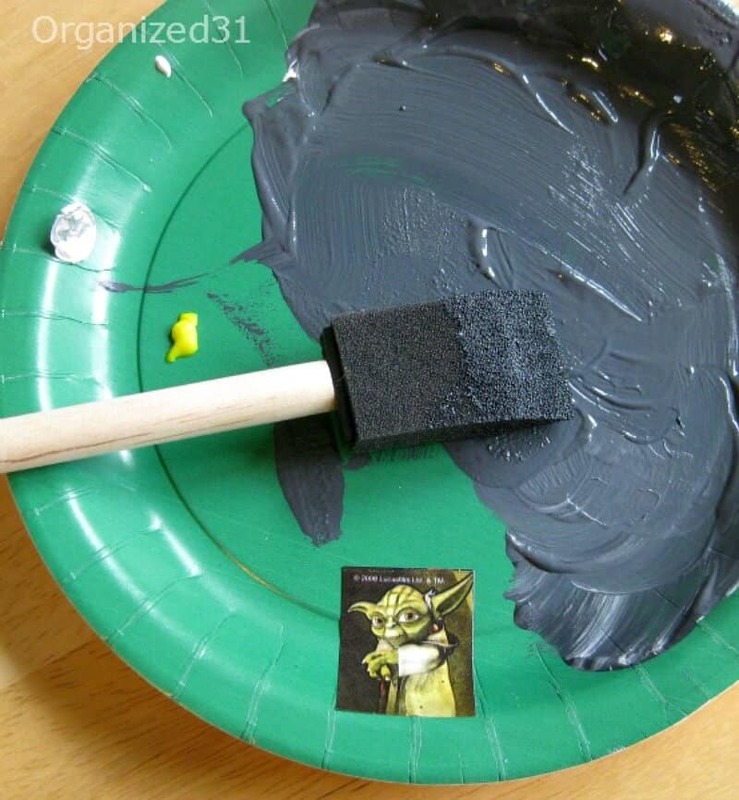 Baby mixed a little white Tulip Soft Matte Fabric paint into the black Tulip Soft Matte Fabric paint to make a lighter black color (it amuses me that we used left-over Star Wars birthday party plates for the paint pallet). 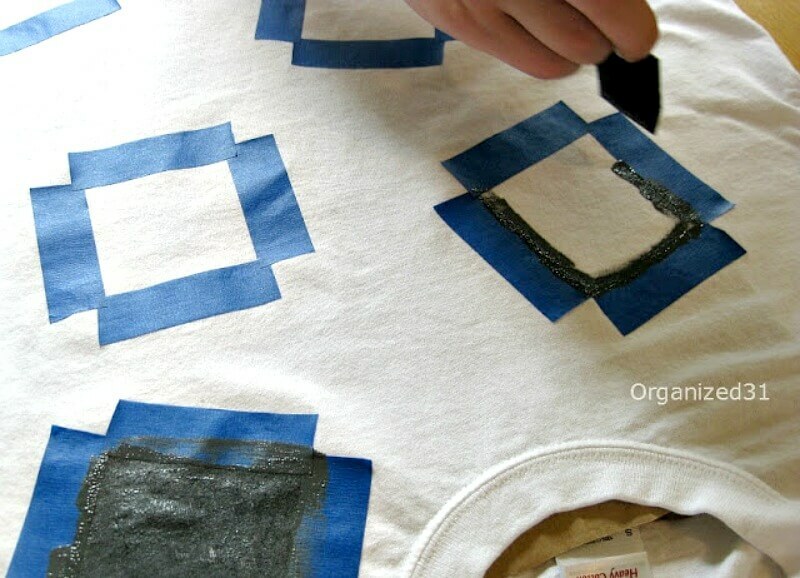 Baby used a sponge paint brush to pounce the paint onto the shirt. She took extra time to get good coverage on the tape edge so she’d have crisp square edges. 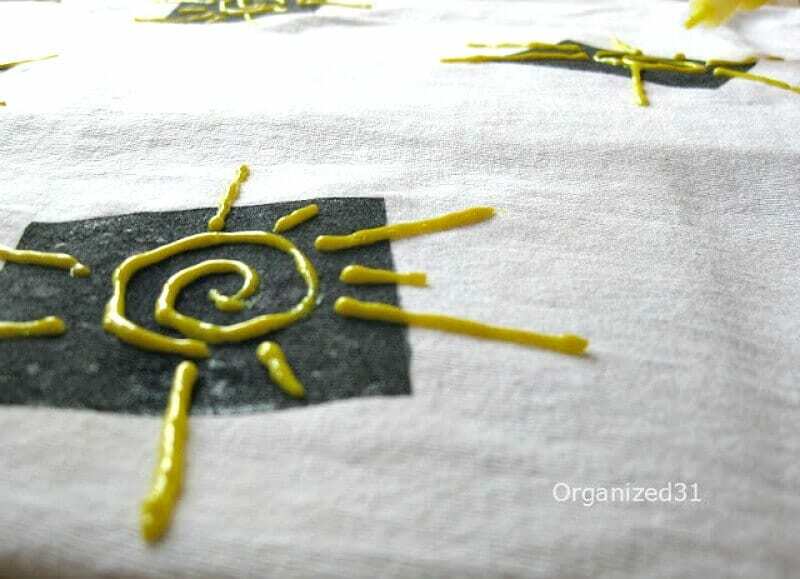 After the black paint dried, Baby used the Tulip 3D paint to freehand draw suns on the squares. 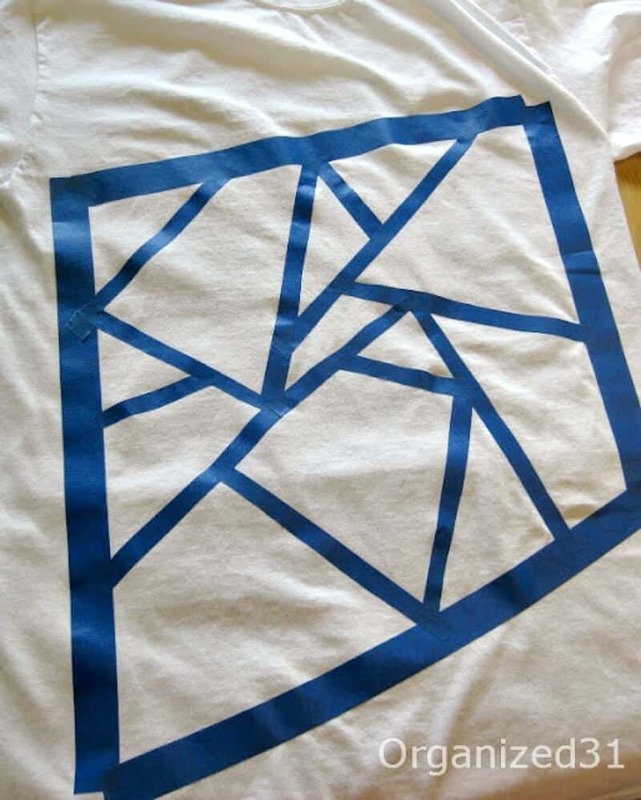 The Soft paint in the black squares keeps the tee soft and flexible, while the 3D paint gives the design dimension. Baby is quite happy with the way her modern twist on 80’s design turned out (and here is our first Tulip 80’s idea sheet pose). See the little black spot near the block on her shoulder? Be careful when you’re pouncing your paint on the shirt that you don’t get carried away and paint outside of your tape. My youngest daughter, Baby Girl, is an artist. She wanted to create a design that looks like stained glass. She used painters tape to block out the border of the design. She then cut the tape lengthwise to have thinner pieces for the shapes inside the border. Baby Girl chose to use yellow, pink and purple Tulip Soft Matte paints and Tulip Soft Pearl paint in green. From experience, we recommend you start painting in one corner and then plan your color placement from that starting corner. We dabbed the colors on the shapes so we didnt’ get confused about what colors went where as we painted. Since Baby Girl was going for a stained glass look, we pounced the paint and painted in in strokes, leaving the paint looking “blotchy”. That helped make the design look more like stained glass when it was finished. 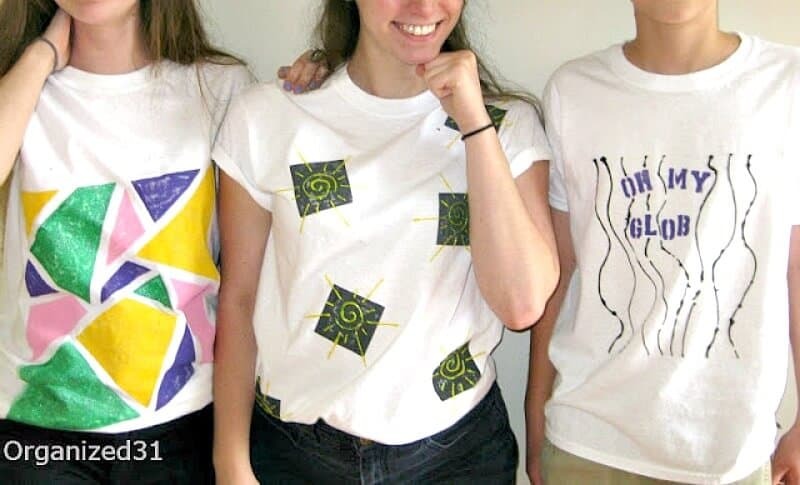 Baby Girl strikes her best 80’s pose (pose number 2) to show off her stained glass tee. 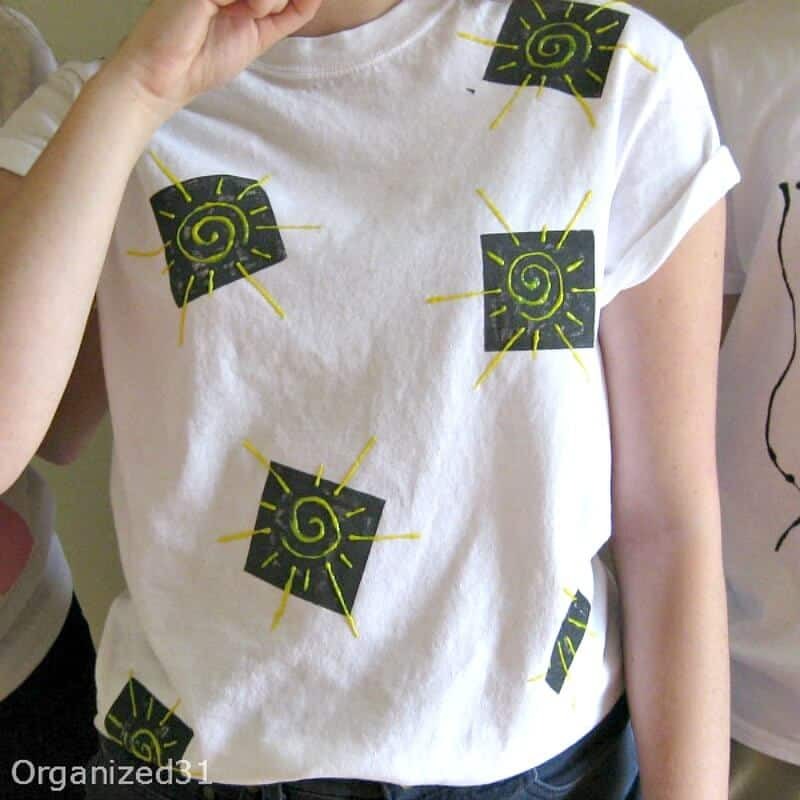 Using the Tulip Soft paint was key in making this large design flexible and wearable. We did learn that you can’t smooth your tape edges out too much. If you look closely at the left edge of the bottom green block, you’ll see that the paint bled under the tape a little. Baby Girl is still pleased with her design, but learn from our mistake. I don’t remember boys making or wearing painted tees in the 80’s, but I wanted to include my son, T, in the shirt painting fun. Because the stenciled letters were a little small, he used Tulip black Puffy paint to add the wavy lines. A quick 80’s pose (pose number 3) showcases the kids’ handiwork. You can find more about Tulip’s current Tie Dye Your Summer Campaign and giveaway by liking them on Facebook, following them on Twitter, following them on Pinterest and checking out their blog. I’d recommend all four for the great ideas and tips. Have fun and “Paint On!” (said in my best 80’s rock voice). 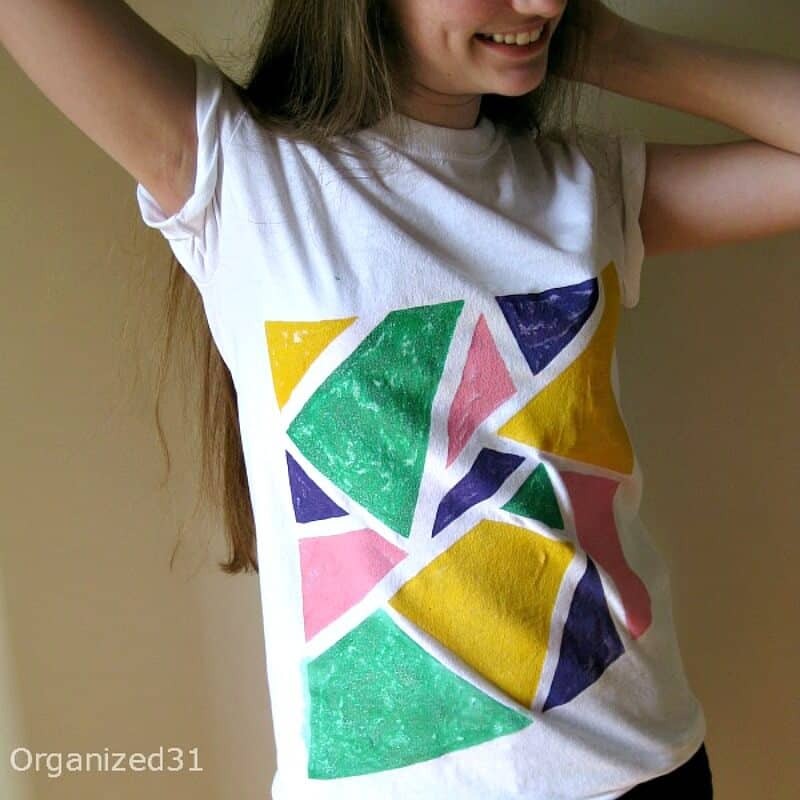 You might also want to check out my Easy Painted Flag Tee. 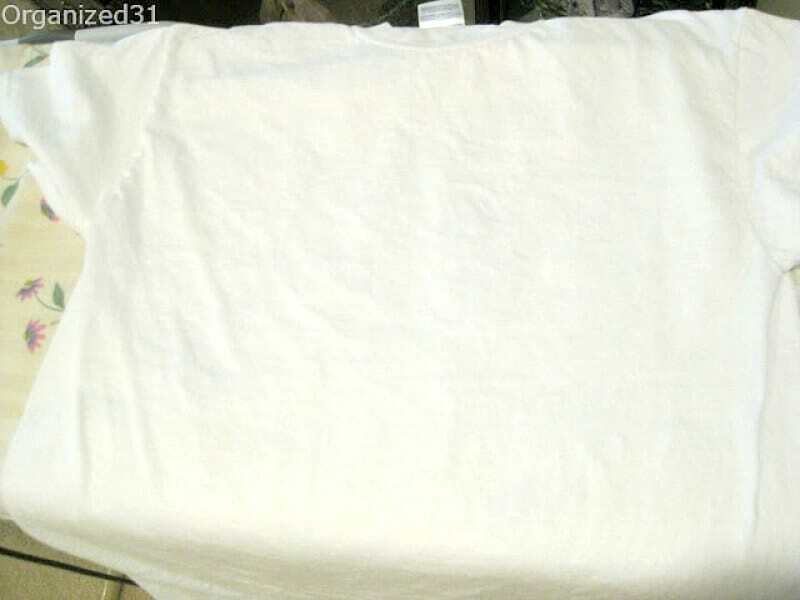 Wow, all four shirts look great! I tried using the letter stencils and had no luck at all. I might try using your tips next time. It took 2 of us to hold the stencil down well. 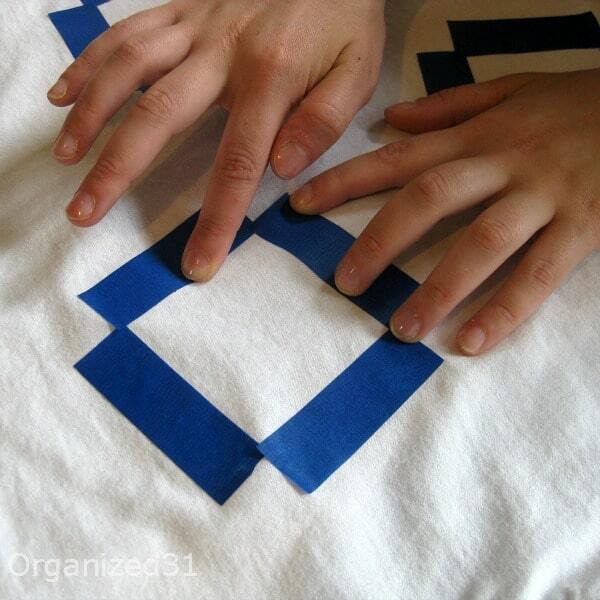 But with both of us pressing the stencil down, it worked well. Lol, Holly. I’d forgotten that one. 🙂 How about one of my favorites, “Hip to Be Square”, who doesn’t love Huey Lewis and the News?! Hi Susan, It looks like an afternoon of fun with the kids! It was fun. It’s getting tougher to get the teens to do projects for me, so I’m treasuring this. 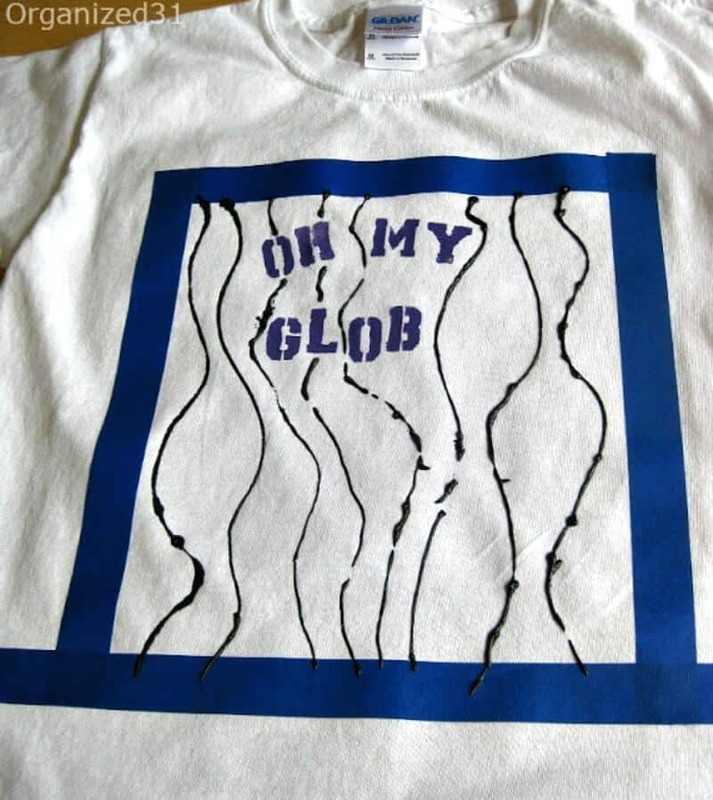 Haha…I so remember making t-shirts with puffy paint! I love the hair! I so loved the 80’s! Great job on the t- shirts! I had an 80’s party already this summer and am planning another in the fall. This will be perfect. Thanks! I love your ideas Susan! What brand of tape did you use? Thanks, Malia. I used… ummm…. blue painters tape? No idea what brand, it’s a roll we’ve had for years. Maybe Scotch brand, but it’s just a guess. Sorry. Very nice! Makes me want to pull some of my old tees out and create something new. i like the way you gave the information with us. You guys had so much fun! I love the kids’ poses! 🙂 Now they know what it was like to be a teen in the 80s! It’s always fun when the goofy spirit hits us! The 80’s were a lot of things, but they sure supplied some fun poses.